Rhona Hoffman Gallery is pleased to present H2O the second solo exhibition at the gallery of works by New York-based artist Spencer Finch. This exhibition is focused on Spencer Finch’s investigation of a substance everyone uses in one way or another every single day—Water. This new body of work includes a molecular light structure based on the chemical make-up of water; an 8 foot by 20 foot fluorescent light box replicating light created by the mist over Niagara Falls which Finch measured on a recent trip; photographs comprising a taxonomy of clouds; and works on paper documenting the evaporation of water and the melting of snowflakes. This investigation is part of a larger exploration of perception, color, and representation that has become central to Finch’s artistic practice. Through various mediums Finch, a constant traveler and scholar of history, confronts the difficulties of “true” representation. Visiting historical and emotionally loaded places like Los Alamos, New Mexico; the city of Troy; Loch Ness; Cape Canaveral; and Tombstone, Arizona, he makes works that take into account the role that memory and association play on perception. The results are often beautiful, playful, and humorous, but always conceptually rigorous. 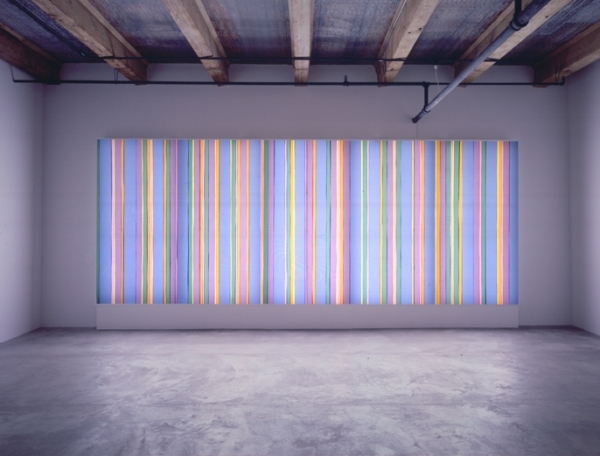 Spencer Finch earned his MFA at the Rhode Island School of Design. His work has been exhibited extensively, including solo exhibitions at Portikus in Frankfurt, Germany, Artpace in San Antonio, Texas, and at the Wadsworth Atheneum, Hartford, CT, and numerous group exhibitions including the 2004 Whitney Biennale at the Whitney Museum of American Art, New York. He collaborated with choreographer William Forsythe on the lighting for Three Atmospheric Studies, performed in Frankfurt and Dresden in April 2005.